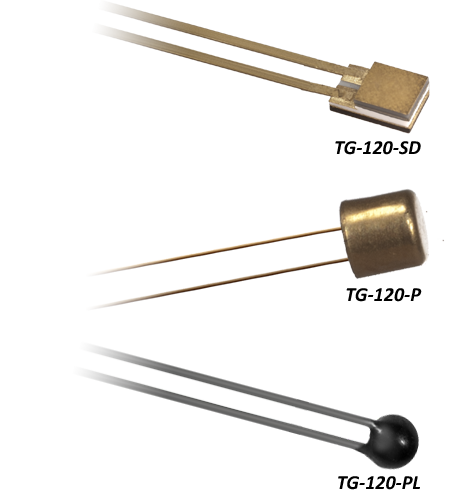 The TG-120 gallium-aluminum-arsenide (GaAlAs) diode cryogenic temperature sensors are particularly well suited for low to moderate magnetic field applications at low temperatures. The GaAlAs sensing element exhibits high sensitivity (dV/dT) at low temperatures. Voltage-temperature characteristics are monotonic over the sensor’s useful range from 1.4 K to 500 K (see data plots on the product page). Gallium-aluminum-arsenide diodes are direct band-gap, single junction devices that produce small output variances in the presence of magnetic fields. Consequently, their low magnetic field dependence makes them ideally suited for applications in moderate magnetic fields up to 5 T.